There is considerable debate surrounding the name Shaddai. I believe the various possibilities are shades of meaning that give us greater understanding of who God is and what He does. Among Christians, the most common interpretation of shaddai today is “mighty,” and El Shaddai would translate to “God Almighty.” Coinciding with this, one suggested root meaning for El Shaddai is “The Overpowerer,” meaning God will do what He purposes to do, overpowering all opposition. Some interpret shaddai as “sufficient,” and God is the “All-sufficient One.” Either interpretation—mighty or sufficient—works for me, because the Almighty is the God who is enough! He is more than sufficient to meet any need. He is power and provision. In great compassion, He sustains, nourishes and protects me. He takes my weakness and gives me strength. He takes my inadequate resources and in His sufficiency uses them for His great and powerful purposes. Yet another possible meaning of El Shaddai is “The God of the Mountain.” Some Messianic teachers say shaddai comes from the Akkadian word shaddu, meaning “mountain.” God lives in heaven, but He also inhabited a mountain top—Mount Sinai. It was on this mountain Moses met with God and received the Ten Commandments. It might be argued God’s presence on that mountain reminded the Israelites of His power and provision. The God of the Mountain was the same God who mightily led His people from Egypt and appeared to them as a cloud by day and a fire at night. He is the God who expected obedience to His commands, and swiftly and powerfully took action against those who rebelled and ignored His will. 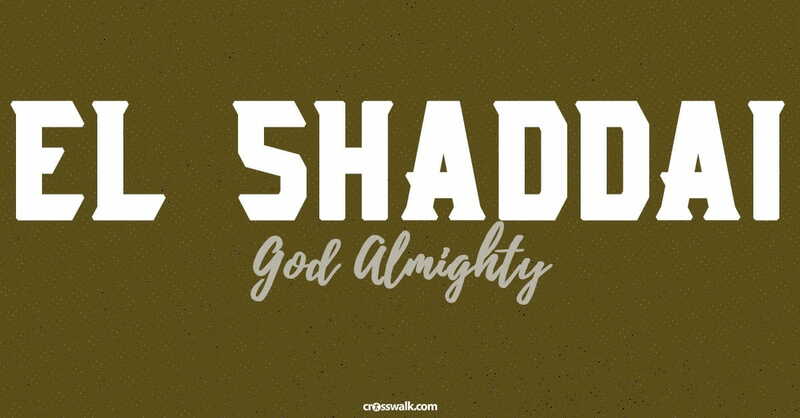 I want to focus on “shaddai” as “almighty. What does “God is Almighty” look like in practical terms? The most obvious expression of God’s might is as the Creator. He is the Maker of all things in the universe—including humans. That isn’t open to dispute in scripture. “All things were made by Him, and without him was not any thing made that was made” (John 1:3). All things were created through the Lord’s power and for Him. God’s might is far beyond ours because He is eternal—the everlasting God from before time and into the timeless future. He is the everlasting King of heaven; and as the Sovereign God, He is answerable to no one! God does “great and awesome” wonders—miracles! There is nothing too hard Him. He has unlimited power. We cannot even imagine all El Shaddai can do! We discover El Shaddai throughout the years of the Patriarchs. Although the surrounding nations had many gods, the Hebrews had one, the Almighty. We see this name for God in Genesis 17:1 when Abraham spoke with God, and also in Genesis 28:3 and 35:11. Jacob asked God Almighty for mercy for his sons concerning their brother Joseph. Later, he described to Joseph how the Almighty appeared to him at Luz. God told Moses of His encounters with Abraham and Jacob as God Almighty, and He added a new name in Exodus 6:2-3—the LORD. Ezekiel also mentioned God’s might and power. The name El Shaddai is found repeatedly in the book of Job, and that is no surprise. Though Job initially contended with the Almighty, God’s display of power and wisdom caused the Patriarch to shut his mouth before the Lord’s sovereignty and authority. The Psalmist wrote about those who contend with and plot against the Father and His anointed Son—trying to claim greater wisdom and power than the Lord of heaven. But scripture says God laughs at their silly assertions. Truly, we can mock and play games with God all we want, but God’s wisdom and power are so far beyond us. We are foolish to contend with the Almighty. Does Our Culture Discount El Shaddai? In modern culture, the proclamation of God’s power has gone silent in many churches. A God of love is more palpable, more easily received, than the God who is sovereign and powerful—the Mighty God who can turn the hearts of kings and direct nations to do His will. Habakkuk’s prayer (3:1-16) expressed some of the reasons the prophet trembled over a “report” about the Lord. He recounted the Lord’s mighty character and works, His anger over sin, and His sovereignty over the nations. When God’s prophets spoke His words with power, sometimes people and nations listened and turned to the Lord; but others resisted God. So it is today when God’s people speak up about His power and might. The mighty God, embodied in Jesus Christ, fed thousands from simple provisions. He healed people and cast out demons that tormented them. He worked mighty miracles to assist His people and rescue them. He even raised people from the dead! What a mighty God we serve—and we need to praise Him. He invites us to call on Him in prayer so He can show us great and mighty things. We can trust Him because He is trustworthy; He is our solid rock and hiding place, our deliverer and protector. We are wise to love and trust Him with all our heart, soul and mind. The Lord says, “Come to Me,” because He knows His power and provision will lead to the peace of hope and praise. The Psalmist says, “Be exalted, O LORD, in your strength! We will sing and praise your power.” The Psalmist looked forward to the Messiah who would come in power; and Zechariah’s words in Luke 1:68 were a song of praise for God’s redemption in Christ. Yet the wonder of all wonders is that the God who is El Shaddai would humble Himself to bring us salvation in His Son. The redeemed church is to thank and praise the meek and mighty Savior. NEXT: What Does the Bible Say about Forgiveness?